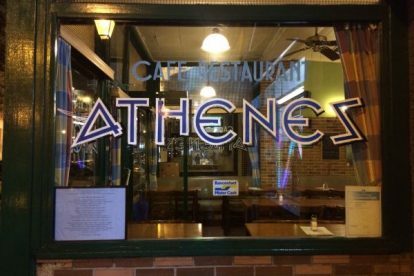 This place might NOT be the typical Greek restaurant with Corinthian pillars and dancing waiters, but it’s definitely one of my favorite spots to score a typical Greek dish when I’m in the Midi region. The place is frequently visited by Greek ‘locals’ and office people, a bit odd that train passengers don’t seem to find their way to this simple but charming Mediterranean tavern. Go into the kitchen to check out for yourself what the day dishes are, a couple of minutes later a huge portion is served at your table. Excellent stuff is the stuffed pepper and the moussaka, which goes along very well with a glass of Malamatina retsina. After you started with an ouzo of course, gia sas!